I'm about halfway through Murder in the Mystery Suite by Ellery Adams. There is a little unexpected twist in the story that has just come to light, which makes it a little more like the TV miniseries The Librarian than I would prefer, but I love the way Adams develops characters and the setting is charming, so I'm sticking with it. I'm also finally approaching the halfway point in A Novena for Murder. I like this book a lot, so I'm not sure why it's taking me so long to finish it! I expect to be done in another day or so. The main character is a plucky older nun, which I love, and there is a strong sense of Catholic morality, even though not all of the characters abide by church teaching. Finally, my husband got me hooked on the audiobook of Shirley Jackson's Life Among the Savages. I listened to a few excerpts with him, and then started over from the beginning on my own, so I'm only about 20 minutes in. Still, I can already tell that Shirley Jackson and I would have been best friends if we'd been alive at the same time. The chapter about giving birth to her third child is especially funny to me right now, but I also love that Jackson doesn't drive or excel at housework, and that, like my own three-year-old, her daughter Jannie has imaginary children who cause problems in public. I am probably going to need to own this in print because there are many sections I know I will want to re-read when I'm done. This past weekend, I finished two middle grade novels for the Old School Kidlit Reading Challenge: The Spettecake Holiday by Edith Unnerstad and D.J. 's Worst Enemy by Robert Burch. Spettecake was great; the other was more moralistic and predictable. Reviews of both are forthcoming. I've also got a whole stack of family stories my husband has recommended, and I'm planning to read at least two more before the month is out. 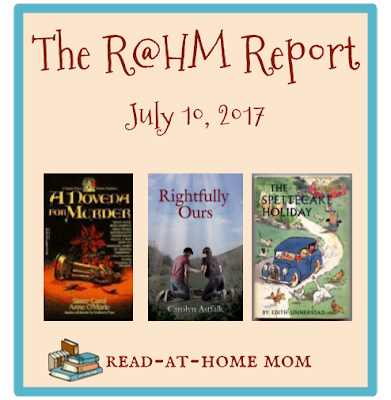 I also happened upon a free Kindle download of a book called Rightfully Ours by Carolyn Astfalk. I don't read a lot of independently published books, but I made an exception for this one because the author writes for Catholic teens and there isn't much Catholic fiction available from any publisher, let alone a mainstream one. The writing is quite good so far, and the characters are suitably flawed, so I'll probably stick with it and see how it goes. Also on my to-read list in the near future are The Quicksand Pond by Janet Taylor Lisle, which I have checked out in Overdrive, and The Silver Moon of Summer by Leila Howland, for which I am 9th or 10th on the Overdrive hold list. Though I am very late to the party, it is still technically Monday in my time zone, so I'm still going to link up with The Book Date and Unleashing Readers / Teach Mentor Texts. The Shirley Jackson book sounds good! Have a great week!